There's a new craze in town: TUSLOB BUWA. Tuslob Buwa experience during our barkada outing (2009). Actually, tuslob buwa has already been around for years. I even wished there'd be tuslob buwa businesses everywhere! I could still remember I posted one tuslob buwa post way back 2011. Anyways, to be honest, I'm quite disappointed with my experience on one of these new tuslob buwa businesses. They served us with pig brain and liver that is so dry! And there are more liver than pig brain. And it's also frustrating to see people saying they'll never have tuslob buwa again but they never really knew how to cook tuslob buwa. I recalled some group who had three orders, cooked everything once, let it cool and eat. MYGHAD! That's NOT tuslob buwa. So if you wanted to have a REAL TUSLOB BUWA experience, go to Pasil. * Pig Brain - We used to buy pig brains on Carbon for only Php10-Php20. I am not really sure how much it costs now that pig brains are in demand. * Pig Liver - Just a really small amount to mix with the pig brain. * Oil from Pork - This is still available in Carbon. This is to be used just like cooking oil. * Marrow Bones - This will be used for the "soup". If not available, may use corn starch, knorr cubes and/or other seasonings. * Seasonings (ie. soy sauce) - This includes seasonings to season the pig brain with. In our case, we often request the pig brain and liver already seasoned and we will get it the next day. You may ask for instructions on how to do the cleaning and seasoning from the vendor just like what a couple of my friends did. Pig brain and liver should already be seasoned. b. Put in some knorr cubes (beef). d. Mix until it's a little viscous. Once the pig brain and liver is ready, heat the frying pan. Add pork oil when frying pan is already hot enough. 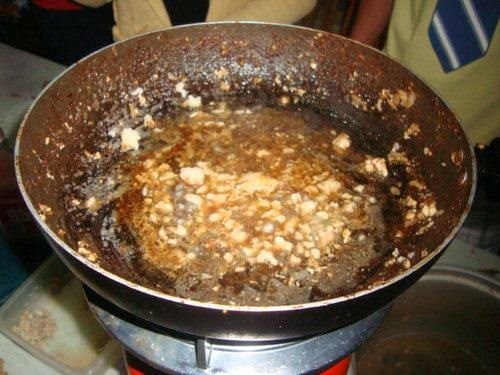 Put pig brain and liver on the frying pan using the tablespoon. How much to place depends on your preference. Add the soup using a ladle. How much to put depends on how much pig brain and liver you placed. Add seasonings based on your preference. As for us, we only add soy sauce. Some would add hipon. For those who want to add onions, you may put them before the pig brain and liver. Get some hanging rice, dip into the frying pan and eat. Dream: The Scene. The Naughty Niece. The Hut.